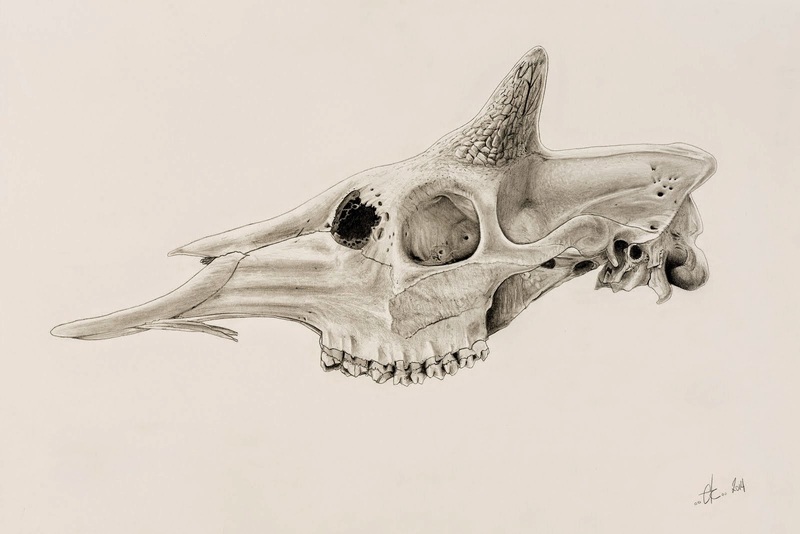 DESCRIPTION: This is an Okapi skull made with pencil and carbon dust technique and reworked with Photoshop. The Okapi (Okapia johnstoni) is an even-toed ungulate mammal from Central Africa, which inhabits canopy forests at altitude of 500 - 1500m. They are herbivores who feed on tree leaves, grasses, fruits and fungi. Together with the giraffe, they are the only two living members of the family Giraffidae. Therefore they are often called living fossils. They are endemic in the tropical forests of Zaire. The average body length is about 2,5m and the height of the shoulder is around 1,5m. Characteristic is the colour of the coat which is chocolate to reddish-brown and on the hind legs there are white horizontal stripes and rings. As in the giraffe you can find horn-like protuberances which are called ossicones, only to be found in males. The IUCN rank Okapis as an endangered species.